A 90-day truce has been declared in the escalating trade hostilities between the U.S. and China after a sidebar meeting at the G20 summit in Buenos Aires between Donald Trump and Xi Jinping. The U.S. has agreed to postpone for 90 days a tariff hike from 10% to 25% on $200 billion worth of Chinese imports scheduled for January 1. China promised it will start buying “a very substantial amount of agricultural, energy, industrial and other product from the U.S.” The U.S. and China will use the next 90 days to “begin negotiations on structural changes with respect to forced technology transfer, intellectual property protection, non-tariff barriers, cyber intrusions and cyber theft, services and agriculture,” according to the White House December 1 announcement. Market watchers are nearly unanimous in welcoming the 90-day truce, but divided on which country has the upper hand in negotiations and whether any substantive agreement on structural changes is likely within the next three months. Section 201 (of the Trade Act of 1974) safeguard tariffs on solar panels and clothes washers from China (and other countries of origin) of 30% went into effect February 7. Section 232 (of the Trade Expansion Act of 1962) tariffs in the interest of national security were imposed on aluminum and steel products from China (and other COOs) starting March 23. Section 301 (of the ’74 Act, as amended) retaliatory tariffs aimed at curbing unfair trade practices were imposed on 818 imports from China effective July 6. A second tranche of tariffs on an additional 279 products took effect August 23. Initially pegged at 10%, the tariffs were re-set at 25%. On September 24, a 10% tariff was imposed on a third batch of 5,700 HS codes. The U.S. was ready to boost the third tranche of Section 301 tariffs to 25% on January 1, and threatening to extend the punitive duties to more Chinese imports. China retaliated with its own tariffs, imposing a 25% tariff on 545 products worth $34 billion in trade on July 6 and an additional 333 products valued at $16 billion on August 23. China has also cut orders for a strategic list of U.S. exports. As we’ve reported before, the toll taken by U.S. tariffs has not been limited to Chinese exporters. U.S. exports – especially in the agricultural sector – have been hit with retaliatory tariffs by China, while U.S. manufacturers have had to bear the costs of pricier inputs that can be had from no source other than China. A process does exist for U.S. companies to apply for exclusions from the tariffs on specific products. The process for Section 301 exclusions is described here. The U.S. Trade Representative prefers that applications be filed via www.regulations.gov. As of this writing, nearly 11,000 applications for waivers of the first tranche of Section 301 tariffs had been filed online under Docket USTR-2018-0025, and 875 applications for exemptions from the second tranche under Docket USTR–2018–0032. That, at least, is the popular explanation for October’s surge in import volumes: U.S. importers have been scrambling to get orders filled before tariffs on over 5,000 imports jumped to 25% in the New Year. Our bill-of-lading import data shows a 14.2% ramp-up in TEUs [the 20-foot-equivalent units used to measure container trade] from China in October compared with the same month in 2017, with a 12.2% lift for waterborne imports overall, as these graphs illustrate. Our latest November data shows import traffic slowing – although Chinese trade is still a healthy 5% above last November’s volume. Far from putting the brakes on Chinese imports, the fear of steeper duties to come, along with China’s retaliatory cutbacks on U.S. exports, appear to have widened the U.S.-China trade gap in the third quarter. While U.S. businesses are feeling the pinch of duty-driven mark-ups on the price of Chinese products, U.S. consumers have yet to share the pain, according to a report from European Network for Economic and Fiscal Policy Research. As reported by American Shipper, the study found that the U.S. 25% increase in tariffs depresses Chinese producer prices by 20.5% and raises U.S. consumer prices by only 4.5%. The U.S. government has chosen to levy import duties on goods with high import elasticities, and so transferred as much as 75% of the tariff burden to Chinese exporters, according to this study. As this blog has previously noted, the U.S. strategy in selecting its Section 301 tariff targets has been to identify the imports that get a boost from Chinese policies – notably the Made in China 2025 initiative to upgrade strategic industries – while minimizing disruption of the U.S. economy and sparing U.S. consumers the loss of well-loved products. When the Section 301 tariffs were first proposed by the Trump administration, color TVs – HS 85287264 – were a top candidate. Ranked tenth among Chinese imports in 2017 (at the 8-digit HS code level), the flat-panel TVs were dropped from the finalized list. This table lists the top Chinese products ranked by U.S. import value subject to 25% tariffs. 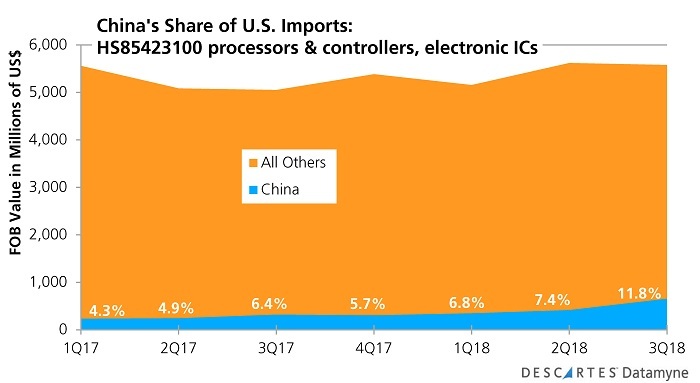 None represents more than a fractional share of what the U.S. buys from China. With the Section 301 tariffs affecting about half of the U.S. import volume from China and about 12% of all U.S. imports, the U.S. appeared to have hit a sweet spot in limiting the negative effects on U.S. consumers and firms while gaining leverage, according to the European Network researchers. However, if tensions continue to ratchet up and more products fall subject to stiff duties, U.S. consumers will likely begin to feel real pain. For the U.S., now is a good time to hit the pause button. For China’s part, calling a draw right now is acceptable. As MarketWatch reported ahead of the truce, China had agreed that it could meet roughly 40% of the 142 trade demands presented by the U.S. earlier this year, and could negotiate a further 40%. President Xi’s December 1 statement on the agreement reached in Buenos Aires lists several actions China will take immediately. It is the remaining 20% of U.S. demands, involving technology transfer, IP protections, and industrial subsidies, that has been the crux of U.S. complaints against China, and that has been non-negotiable for China. Whether 90 days will be enough to achieve a break-through on these issues remains to be seen. Descartes Datamyne™ can provide a wealth of data on U.S. trade including values and volumes by specific HS code. In addition, our maritime bill of lading data captures the transactional and logistical details of U.S. import trade – including consignees, shippers, and notify parties, cargo values and volumes. Ask for a demo.